When walking through a rain forest, you would definitely come across the awesome Weeping Fig tree; that is their natural habitat, anyway. This awesome tree can grow very big when left in the wild or when grown outdoors. They do, however, tend to be a bit smaller when grown indoors, so if you have high ceilings with skylights, expect it reach a 10ft tall maximum height or 3ft tall for the miniature varieties. With branches large and arching, and the leaves long and pointed, it is a very attractive plant to have in your yard or building. The Weeping Fig gets even more attractive when the flexible trunk is braided to create an awesome decorative look. Away from the rainforests and the indoor planted Weeping Fig, they are also a favorite in parks and along wide roads because of how tall they can grow in natural conditions. 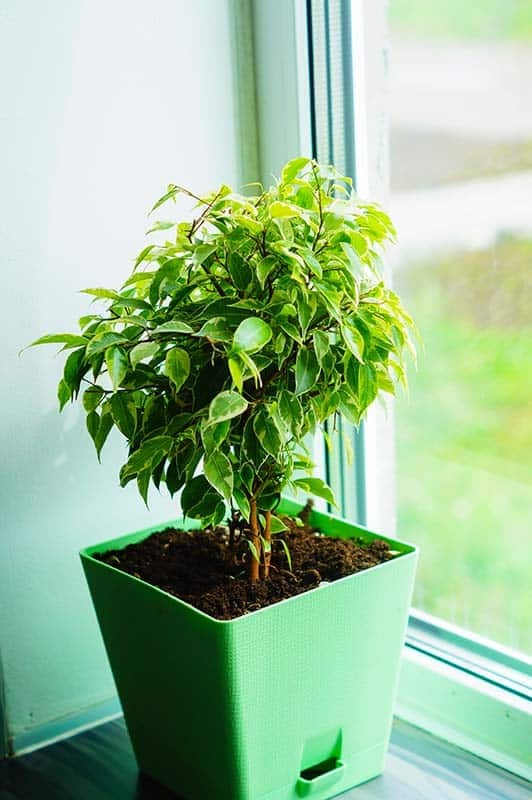 The F. benjamina is known as one of the plants that greatly improves the quality of air indoors. Formaldehyde, trichloroethylene, and benzene are some of the toxins that a Weeping Fig will dispel from the area. As much as it greatly improves the quality of air, it is also a major source of allergens found in the house. It ranked third globally after dust and pets. Some of the symptoms of allergy linked to the Weeping Fig are allergic asthma and also rhino conjunctivitis. The most affected people are those suffering latex allergy. This is because there are high concentrations of latex in the Weeping Fig. in very extreme cases, the sap from the plant might result in an anaphylactic shock to people suffering from the allergy to latex. The allergy to the plant is known to gradually increase over a period of time. The allergy was first seen among workers who lived in occupational settings when they were regularly handling the Weeping Fig. Results of the study, which was conducted on various workers in at least four plant firms, showed that 27% of them had developed particular antibodies as a response to how they were exposed to the plants. It is, therefore, much safer not to plant the Weeping Fig close to people with an allergy to latex. When grown indoors the Ficus benjamina tends to grow very slowly. This is, however, a very different story from when it is planted outdoors. According to gardening know-how, when planted as an outdoor plant and left unpruned, it quickly becomes gigantic. This shouldn’t be a problem, though, if you desire to have a smaller plant because it is very easy to tame, and it tolerates heavy pruning very well. This allows you to take off even a third of the growth found on the outer canopy of the plant. When planted outside, the roots of a Weeping Fig grow as fast as the tree itself. The rapid growth can lead to the tree causing great damage to gardens, sideways, patios, and also driveways. To be on the safe side when planting it in its tree form, try planting it away from buildings or gardens. It is because of this reason that experts advise that, in a residential setting, the F. benjamina should be kept as a clipped screen or hedge. There are many different varieties of the Ficus benjamina plant, many of them commonly found in the wild. Here are the four most common species. The midnight beauty is always linked to the Ficus indigo. It has very dark and bluish (almost black) leaves that have a bright glossy look. The leaves sit on the stem in close internodes. The growth pattern of the Midnight Beauty is upright, and it has a strong apex dominance. 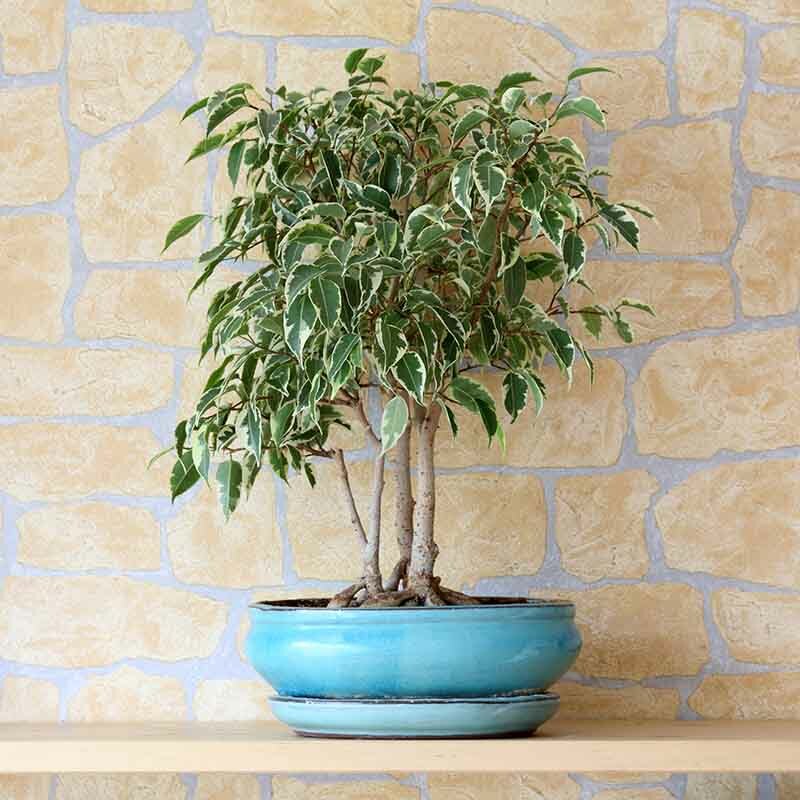 Over the years, the plant has become a favorite among gardeners who prefer having their Weeping Fig plant indoors. Ficus Monique is a rather upright species of the Weeping Fig with a bushy kind of growth pattern. Its glossy leaves have ruffled edges that are bright green. When exposed to lower light intensity, its ruffled leaves become accentuated and when mature, the leaves on Ficus Monique become hard and crispy. Many people like it because of how resistant it is to shedding its leaves, a feature that greatly sets it apart from the rest of the Ficus Benjamina species. When planting the Weeping Fig, you have to ensure that you have a loosely mixed soil that drains well. The plant does very well when exposed to bright light, but it can also do considerably well in partial shade. When grown indoors, you should select a convenient spot where you won’t need to move it very often. It doesn’t like being moved from one place to another. When moved, it reacts by shedding of all its leaves and replaces it with new ones. It immediately adapts to the light intensity of the new location. You might be very discouraged when trying to grow the Weeping Fig indoors because of the level of care it needs. The fact that it responds to every problem with shedding off its leaves does not make the situation any better either. However, with just these simple steps, it is one of the best plants you can keep indoors. It is also important to note that the plant highly tolerates growth in poor conditions. Light plays a big part in the life of a Weeping Fig. When you look at its origin, you’ll realize it came from the tropics where there is abundant sunshine. Though it has greatly evolved, light is still a major part of what makes it grow well. Keep it moderately watered at all times. The soil need not be soggy, but it is imperative that it is not too dry either. Too much water in the plant causes it to shed all the leaves, and it might cause root rot in extreme cases. Another very important thing to note is that the Weeping Fig is very sensitive to most of the chemicals found in city tap water, such as chlorine and fluoride. Therefore, when watering, use only distilled water, or you can let the chemicals in the tap water dissipate by letting it sit overnight. The Weeping Fig grows well in well-draining soils. Soils that retain a lot of water can cause the roots to rot. While the Weeping Fig is very wild when grown outside and also grows very fast, when grown indoors, it is the opposite situation whereby you will have to add fertilizer to it at least once a month between the months of April and September to enhance its growth. The growth levels of the F. benjamina are relatively low, so you might not have any need for re-potting for the first 4-5 years. It is better to avoid moving the plant unnecessarily because as we have seen, moving the plant causes it to shed all its leaves. When you see that your Wedding Fig plant has overgrown than you want, or there are broken and dead growth of your plants, it's time to do a renewal pruning. It's advised that your plant should be pruned after its active growth period. And always remove no more than a third of the branches. Make the cut near the trunk, the growth node, where the new growth will sprout. The Weeping Fig can be easily rooted just from the cuttings without using a rooting hormone. We recommend taking the cuttings during the warmer seasons for them to have enough supply of moisture and warmth. It is very hard for any a Ficus tree to grow from a seed. Also, it is not common to see plants grown indoors yield any fruit or seed. The most common insects found on the Weeping Fig are thrips. Others include aphids, mealybugs, and whitefly. There are various diseases that might attack your plant whether it is planted indoors or outdoors. This is irrespective of how good you are at gardening. Some diseases find their way to the plant no matter what you do. Brown or yellowish spots on the leaves or even dropping leaves are a typical sign of fungus. Leaves getting stuck together or sticky liquid dropping off the leaves show an invasion of either scales or spider mites. Pests can also cause the plant to have dry leaves that continuously fall off the plant. Using a cotton stick, rinse out the area that is contaminated with a fungicide. Neem oil is a favorite among many people because it is locally available, very effective, and also safe to use in the house. When you realize one of your plants has an infection or that it has been infested by pests, immediately separate it from the rest. This will greatly reduce the chance of the infection or the pests spreading to the other plants. Keeping the leaves dry and not overwatering also greatly reduces the risk of infections on a Weeping Fig. Pruning the plant regularly, including taking away dead branches and picking up dead leaves, is very vital in ensuring that pests and even diseases are controlled. Once it is established, the F. benjamina is highly drought and heat-resistant. It rarely dries up even during the summer unless there is a severe drought. Hard frost can damage Weeping Fig badly. It is, therefore, very important that the roots are protected during the winter because this is the only way for it to rebound once the cold season is over. Due to their arched branches, Weeping Figs are prone to breakage in the case of strong winds. The best way to counter this is by planting it where it is protected from the wind. The best way to take care of a Weeping Fig planted outdoors is to keep the soil moist but not wet. During the winter, try to protect its roots from the harsh winter weather. 1. My Weeping Fig has been shedding its leaves from the beginning of fall. What should I do? Weeping figs tend to shed some of its leaves in the beginning of fall. This can be explained by its origin where they have to shed most of their leaves at the beginning of every dry season. If you notice this, lightly mist it to increase the humidity, but don’t be tempted to overwater it as this might cause other problems. 2. My plant has very few pale and springy leaves. What could be the problem? This shows a lack of enough light. Try changing its position to a place with more ample sunlight. 3. The leaves on my Weeping Fig are dry and are falling off. What should I do? These kinds of leaves could mean that your plant is underwatered. Check the soil that it is planted in and if you find that it is very dry, try soaking the whole pot in lukewarm water for a few minutes. Then continue with an adjusted watering schedule. If planted outdoors, it is important that you prune it regularly. When planted indoors, however, you only need to prune it when you see dead leaves or branches. 5. There are yellowish spots on my Weeping Fig. What could it be? Yellow or brownish spots on a Weeping Fig shows that it has fungus. Rinse it with Neem oil and make sure you separate it from your other plants to avoid spreading the infection. 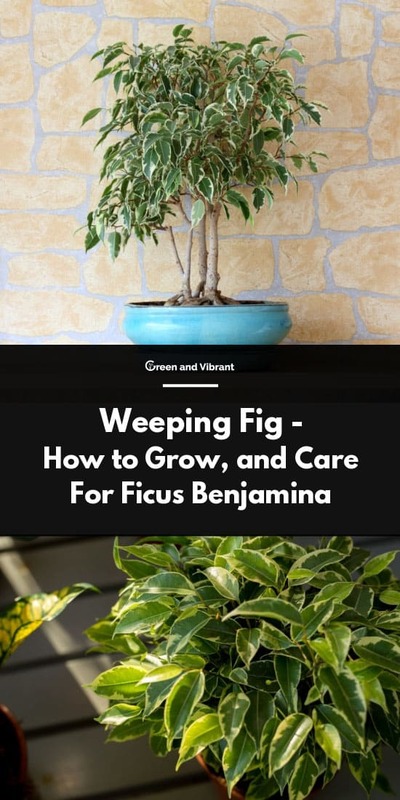 The Weeping Fig is a very interesting plant to have around. It can live for a long time, and with the proper care, you will have it as a companion for very many years.